When you meet her for the first time, she will give you a brief introduction: "Aryarie. Your friendly Guild Alchemist. Satisfaction guaranteed. No free samples." She also have a few controversial opinions to share about Bravil: "Bravil? Good points? Cheap to live. Unpretentious. Free-wheeling. Bad points? Culturally, a hole. Count's a clown and his son's a skooma-sucker." 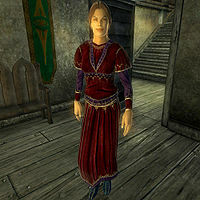 On the Mages Guild topic, she will quickly guide you on to somebody else: "I'm just here doing research. If you need spells, talk to Ita or Delphine. They'll be happy to help." Esta página foi modificada pela última vez à(s) 05h16min de 20 de outubro de 2015.